I don't usually teach any knitting classes in December, but my Wednesday night class wanted to keep going so we agreed to have a two-week session instead of the usual four weeks. We didn't get too much knitting done the last week, though, because we had a little Christmas party and there wasn't room for any projects on the table, what with all the good food everybody brought. I wish I had brought my camera because it was quite a spread and a beautiful sight. We had chips and dips and guacamole and Corn Flakes wreaths (so much better than Rice Krispies treats, I've got to tell you), salami and cheese and toasted pita bread and crackers, a lovely platter chock-full of wonderful cookies, nuts and candies, and most excellent wine. I brought my graham cracker brownies. It was a great way to kick off the holidays. And an even better way to kick off the holidays was with the lovely gift bag one of my students gave me. I really wasn't expecting anything so it was quite a surprise. I could hardly wait to get home and see what was inside. Koeze Cream-Nut peanut butter comes from Grand Rapids, Michigan, and contains only Virginia peanuts and salt. I know there may be some purists out there who believe there shouldn't even be salt in there, but I don't agree. There are some things that need a little salt, and peanut butter is one of them, in my opinion. It's ground in small batches and just may be the best peanut butter I've ever tasted. 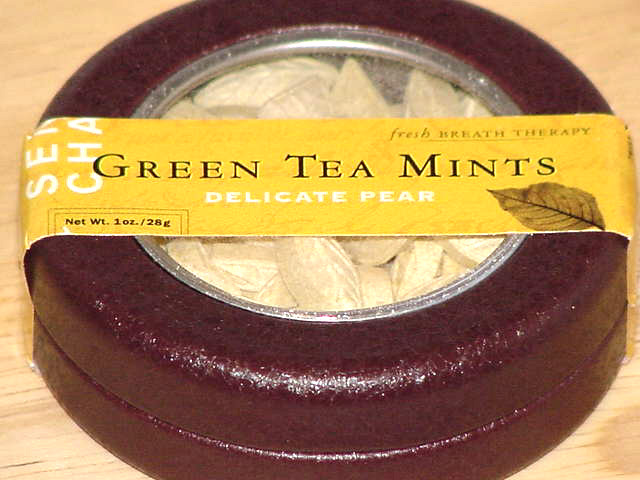 I've never seen green tea mints so I was quite pleased to get some, and I love pears so "Delicate Pear" flavored green tea mints were the perfect flavor. Three mints are equal to one cup of green tea, and they are caffeine and sugar free. The green tea, mint and pear flavors are so perfectly balanced I can taste each one of them without any one overpowering the others. And it's a Fair-Trade product to boot. 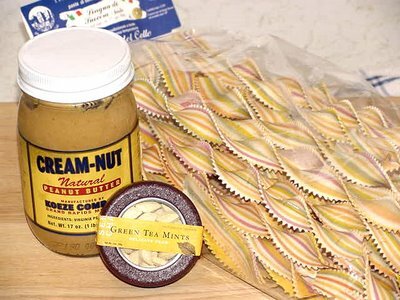 And the hand-made ribbon pasta is most intriguing. It's imported from Italy, the home of the Slow Food movement. Most of the label is in Italian, but it looks like it's a regional specialty of Puglia called Lingua di Suocera (mother-in-law's tongue). It's imported by the Crystal Food Import Coop, but I can't find it on their site. The colors come from beets, spinach, paprika, and curcuma, which Gernot Katzer's Spice Pages tells me is turmeric. I already have some idea of how I want to use it, but it will take some time because I need to do a little research before I can begin. It was obvious to me that some time was taken in finding each one of these thoughtful gifts. I sure am one lucky knitting teacher!